NOTE: THIS IS NOT A "REGULATOR EXTENSION CORD." IT WILL NOT WORK. THIS HOSE REPLACES THE HOSE COMING DIRECTLY OUT OF YOUR REGULATOR. THIS IS SO YOU DO NOT HAVE TO PURCHASE AN ENTIRE REGULATOR IF THE HOSE HAS A LEAK. 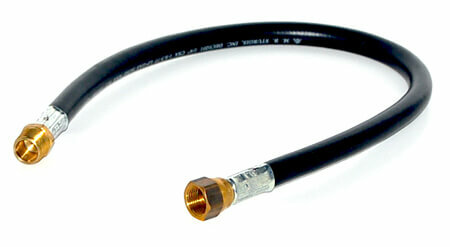 SOME REGULATORS HAVE CRIMPED-ON HOSES WHICH CANNOT BE REMOVED - BE SURE TO CHECK YOURS FIRST. will this hose fit a perfect flame grill? Please check to see if you can remove your regulator and your hose does not need to be any longer than 21"
Is this hose available in a shorter length - 12"? 21" is the only length we carry for this hose. Longer is OK, it it is too short is when you run into problems.